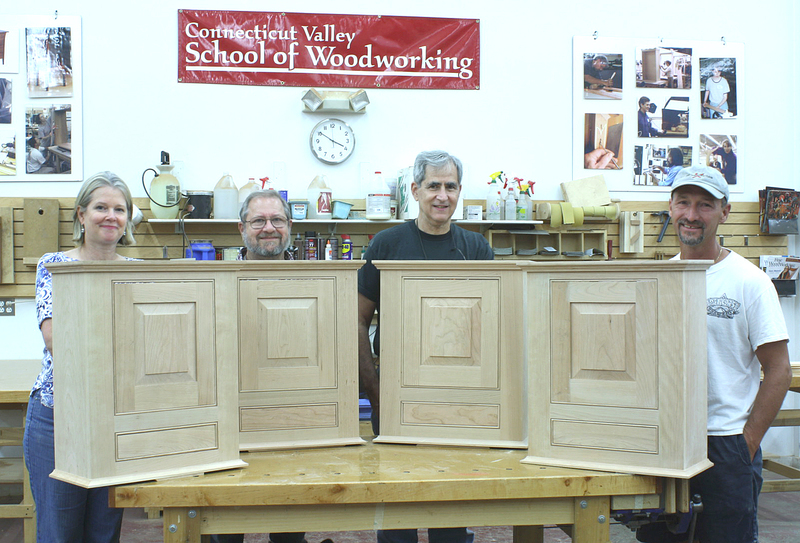 This past week I have been in Connecticut teaching a class at the Connecticut Valley School of Woodworking (CVSW). If you are looking at a class or two to up your woodworking IQ, you owe it to yourself to check out Bob Van Dyke’s place. CVSW is a huge, well-equiped woodworking shop. Bob runs the school, teaches and brings in instructors from across the country to enhance his already superior selection of classes. Visit the school’s web site to look at the class list and you’ll find everything from saw sharpening to building a Goddard Newport Tea Table. And the list of instructors is second to none with names such as Alf Sharp, Will Neptune and Steve Latta. During the week, students constructed a hand dovetailed, hanging wall box complete with a raised panel door and a drawer. Each student finished the project completely, including backboards. They all did a great job. Nice work. Bob Van Dyke explores the clock hood. 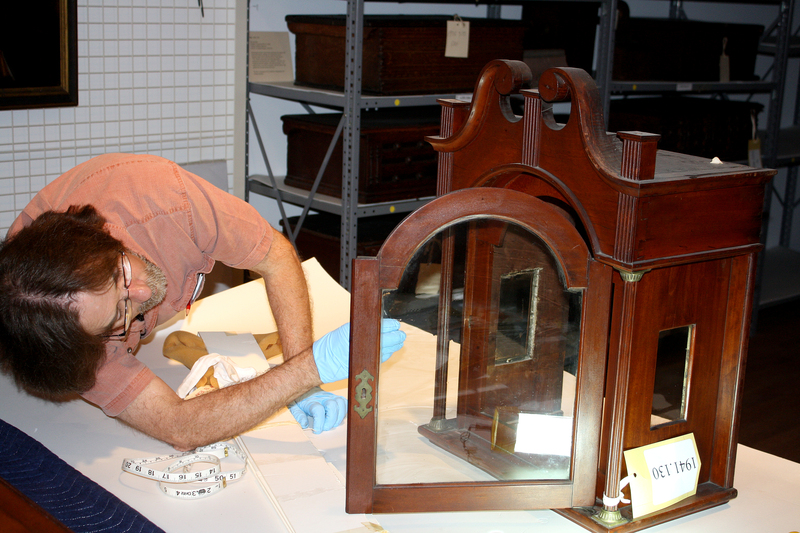 About mid week, Bob, Mickey Callahan and I squeezed in a visit to the Wadsworth Atheneum to measure a Burnap tall clock for an upcoming class taught by Chuck Bender (click here to see the class listing then scroll down). On a floor reserved for museum personnel, full hands-on access to the clock was made available. As a woodworker,I felt like I had opened the door to antique furniture heaven as we explored and measured the clock and discussed period construction techniques. Thursday, not to be out done by the Atheneum, Bob ran me down to the Connecticut Historical Society (CHS) to take a look at a current exhibit where pieces built by members of the Society of American Period Furniture Makers are on display next to many of the pieces from the CHS collection. The exhibit runs through September 8, 2012 and is well worth a visit – the craftsmanship is top notch and the exhibit is impressive. What you see in the opening photo is something I knew nothing about – didn’t even know it existed. The museum card called it a body preserver. I came to find out that this was used for wakes. 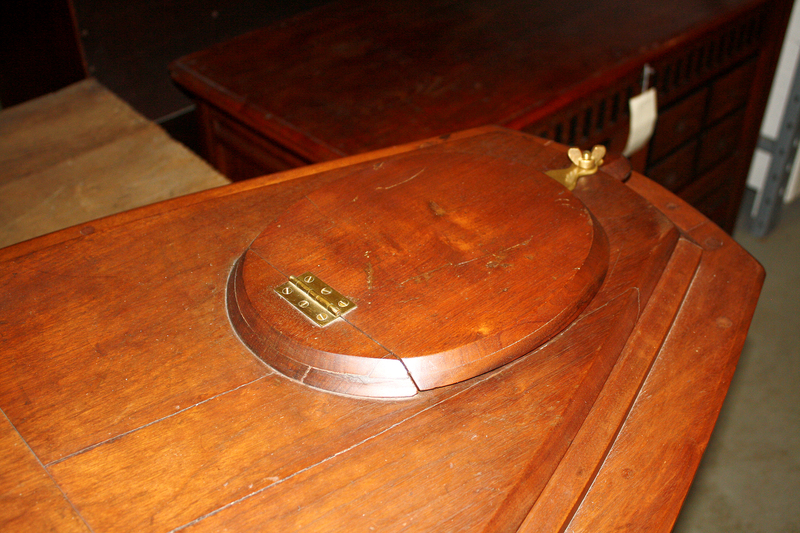 The case separates about 10″ up from the bottom and a body is fit into the lower section. 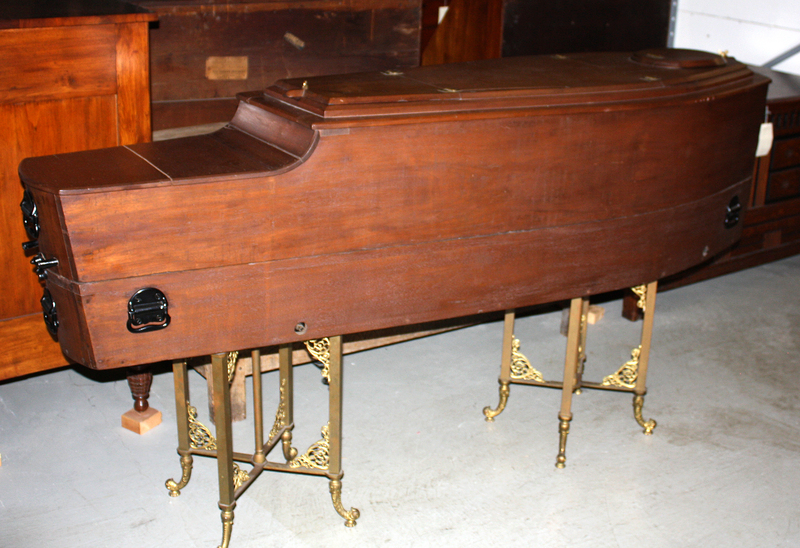 The round plate at one end is for viewing the face of the deceased. With that plate opened, you can not only see how the face is viewed, but you can also see a metal liner. The liner protects the body from the huge amounts of ice that were used to keep the body cool while on display. 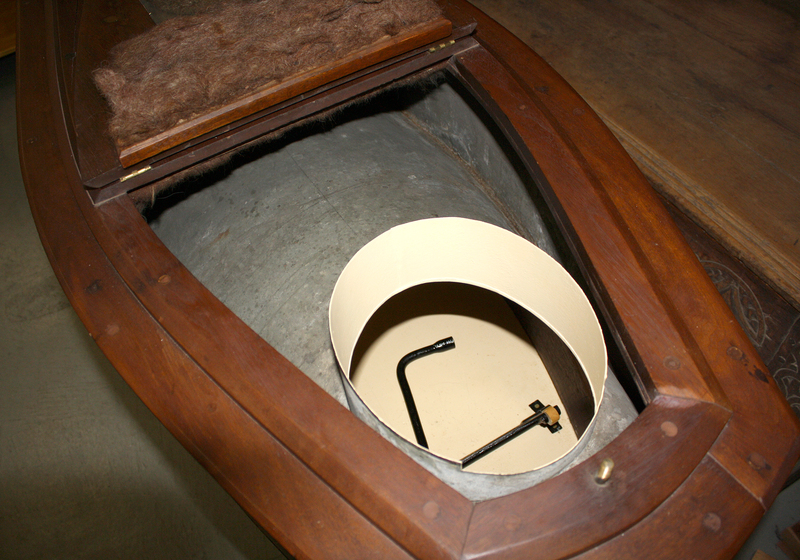 Inside the face area, the museum stores the crank used to adjust the corpse. At the head end, you could crank the upper torso upward to better frame the face in the viewing window. At the foot end it was sometimes necessary to raise the knees to better fit a taller corpse in the body perserver. In the last photo you can also see drain tubes that allowed water from melted ice to vacate the preserver. 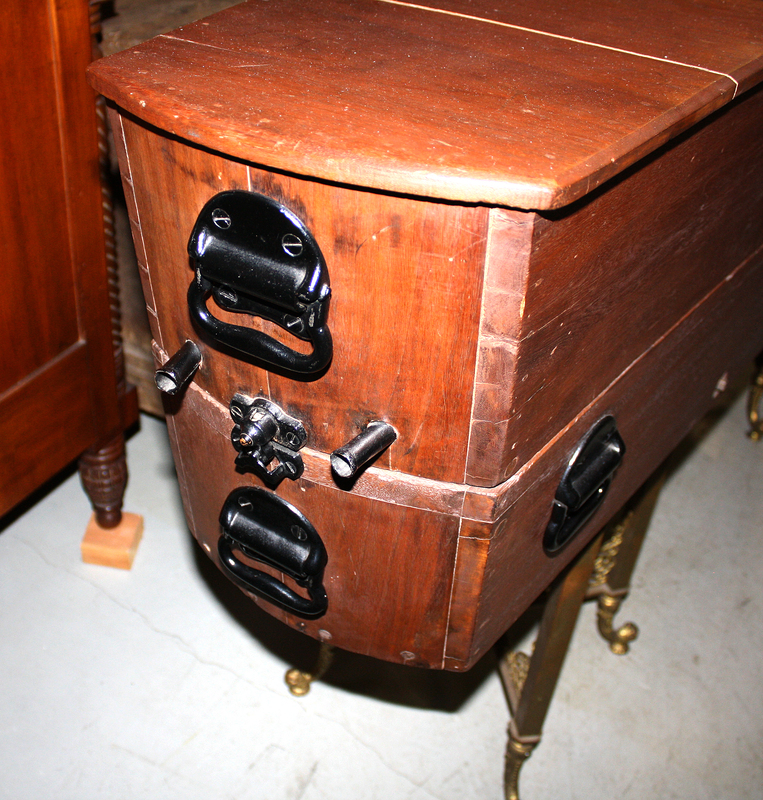 You should note the quality joinery, expensive brass hardware and elegant based. This was an expensive piece of furniture.